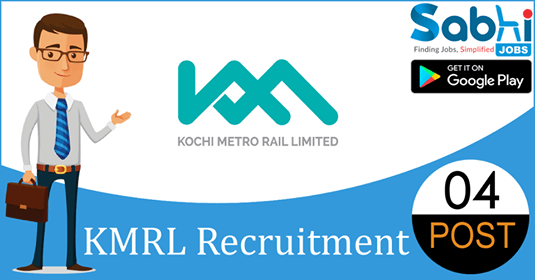 KMRL recruitment 2018-19 notification has been released on official website www.kochimetro.org for the recruitment of 04 vacancies at Kochi Metro Rail Limited. The candidate who is looking for Manager-IT/Smart Solutions, Deputy General Manager-Transport & Various Vacancies can apply online application on or before 25th July 2018. Qualification Manager-IT/Smart Solutions: B.Tech in Computer Science/IT or Masters in Computer Applications (2 Years) or equivalent. Deputy General Manager-Transport: Degree in Civil Engineering or equivalent. Deputy General Manager-Energy: Degree in Electrical Engineering/Electrical or Electronics Engineering or equivalent. Deputy General Manager-Environment, Sewerage, Solid Waste Management: Degree in Civil Engineering with Masters Degree in Environmental Engineering/PHE or equivalent. How to Apply Interested and eligible candidates may apply online application form at official website www.kochimetro.org on or before 25th July 2018.